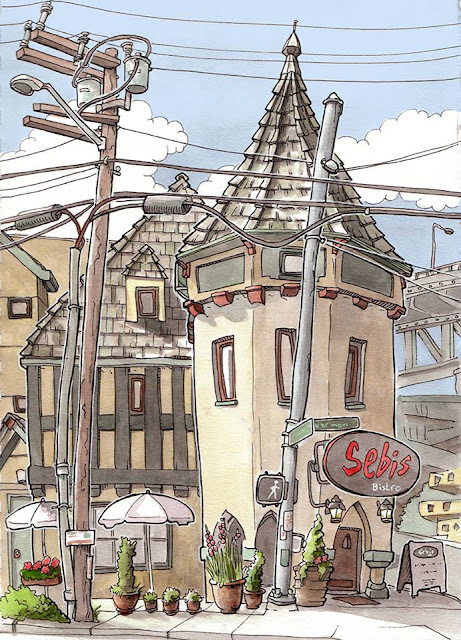 I pass this restaurant every time I run the 7 mile loop around Lake Union, (a couple of times a week if Jackie shames me into it). Yesterday the light struck it just right and I made a mental note to come back and draw the view from the west side. When I got there, I noticed the light was even better from the north view, so I set up my stool in the shade of a street sign. I had to push the telephone poles around to make a better composition so things wouldn't all be parallel to each other, and the electrical hardware at the top of the pole was way out of view so I shortened the telephone pole considerably so I could include it in the drawing. That's why I always carry my artistic license. I gonna have to start carrying that license too. Great sketch. Ha, very clever how you circumvent the electrical permit process! Just goes to show the power of the artistic license .. it's all about the composition! duh..I remember this place from the 1970's..after walking across Univ Bridge from the Red Robin which no longer exists there..